No seriously…where does the time go? Days seem to crawl by sometimes, but then all of a sudden it’s Spring! And we haven’t written a blog post in what seems like ages! I can’t promise this next one here is going to be great, but it’s something. We’ve been enjoying our house lately and slowing down on major projects. We’re still bustin’ doors left and right, so definitely stay tuned for some updates on that. It’s been super warm here in Jersey. We recently bought some new window A/C units because the ones that came with our house were pretty old and the one started leaking toward the end of last Summer. It’s a good thing we got them when we did because many of the Lowe’s in our immediate area were sold out of the units we were looking for! It’s been so warm, we actually installed the new A/C unit for the bedroom the other day. We heard it was going to be almost 80 today so we figured we might need it! Turns out, it’s not going to be quite that warm, especially at night. Nevertheless, we don’t plan on needing the heat again until October so there the A/C unit stays! Anyway, it’s the tricks of the trade. We hardly ever pay full price for anything, ever, ever, ever. And when we get into situations with Comcast or if we buy a defective water filter for our Samsung refrigerator (true story) we get something in return. We recently got a ton of credits toward Best Buy because of their horrible customer service over the phone. I literally just asked for extra Reward points and they gave them to me, so we bought (for FREE) a wall mount for our new bedroom TV. We’ve lowered our Comcast bill on more than one occasion since we moved in, and this was all done via their Live Chat service. As for our defective water filter? We badgered Samsung a bit until they decided to send us a $50 Lowe’s gift card – more than enough to cover the cost of the filter. This entry was posted in Around the House, Backyard, Budget, DIY, Outdoors and tagged backyard, backyard diy, coupons, diy, home improvement by Megan. Bookmark the permalink. Well, hey! That’s your head…and my hands! Hah! 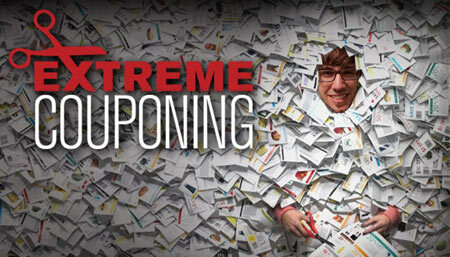 We like to pretend we’re extreme couponers but the pros are amazing!